Teltonika FMB920 is compact and smart tracker with Bluetooth connectivity, internal High Gain GNSS and GSM antennas and integrated backup battery. FMB920 is designed for light vehicles tracking in applications like insurance telematics, rental cars, recovery of stolen cars, public safety services, delivery transport, taxi and much more. Inputs/outputs extend device usage scenarios. Digital input can be used for ignition, door or alarm button status monitoring. Vehicle remote immobilizing may be achieved using FMB920 digital output. FMB920 will store all data in microSD card when driving in areas where GSM is not available. FMB920 features new case design which ensures increased protection against dust ingress and water splash from any direction. 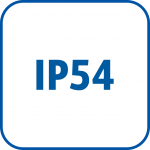 It is certified according IP54 protection class. FMB920 with IP54 case can be installed in machines with increased posibility of dust and water ingress.